Redemption of the Focus and Endura - Ford Owner Loyalty Bonus Offer is subject to the following Terms and Conditions: 1. This Offer is only available to: a. Fiesta, Focus, Falcon or Territory owners that present a proof of ownership (in the name of the individual or business entity to whom the vehicle is registered), or b. Customers that present a copy of the eDM received from Ford of Australia at participating Ford Dealers at the time of ordering an eligible new Ford vehicle, or 2. The Offer commences on February 5th 2019 and expires March 31st 2019 (Offer Period). 3. 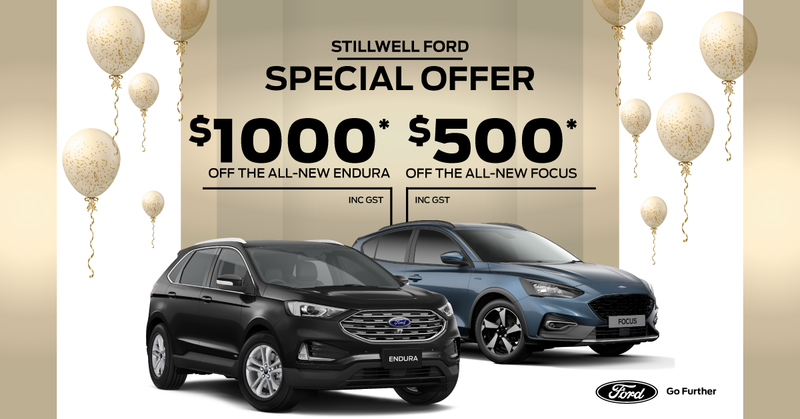 This Offer is only available when a customer purchases an eligible new Ford Focus or Endura vehicle that are ordered and retail reported in VISTA up to and including March 31st, 2019. 4. This following buyer types are eligible for the offer: Private, Blue, Silver, Gold, Privilege Club and Dealership Employee. 5. The new Ford vehicle(s) purchased under the Focus and Endura - Ford Owner Loyalty Bonus Offer must be registered in the Fiesta, Focus, Falcon or Territory owners individual name or business entity to whom the vehicle is registered. 6. The Offer may be combined with any other offer or promotion in the market run by Ford, including in conjunction with Privilege Club /Dealership Employee Pricing (Privilege Club Pricing is a vehicle discount program available only to Ford Employees and Retirees and their eligible relatives through authorised Ford Dealerships). 7. The Offer can only be redeemed once per vehicle purchase. 8. The Focus and Endura - Ford Owner Loyalty Bonus Offer is not transferable or redeemable for cash and must be included "in-deal". 9. Please note that this is a recommended offer only.